The Best Western Hotel Ronceray Opera is ideally located in the center of Paris. Come and experience our hotel near the major tourist attractions. Best price guaranteed and exclusive deals. 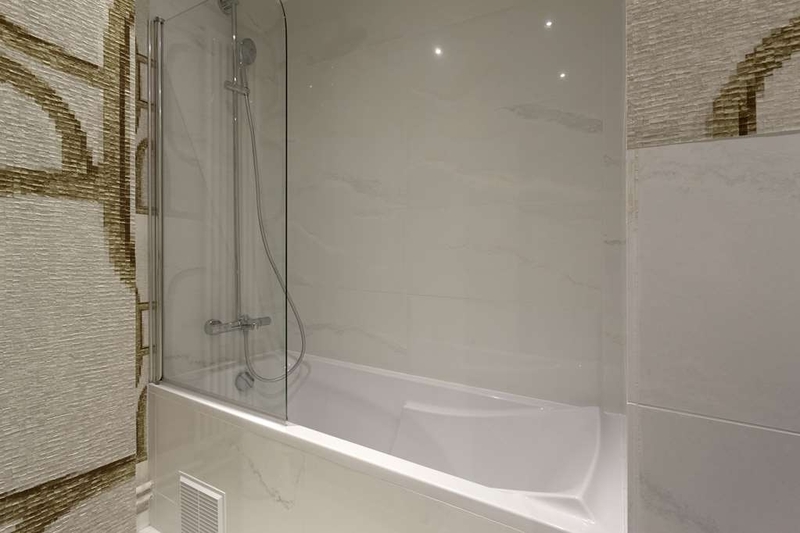 In the heart of Paris, above one of Paris covered passages, close to the Opera Garnier, the Parisian department stores and the business centre. The Best Western Hotel Ronceray Opera offers you services and equipment blending luxury, history and modernism. 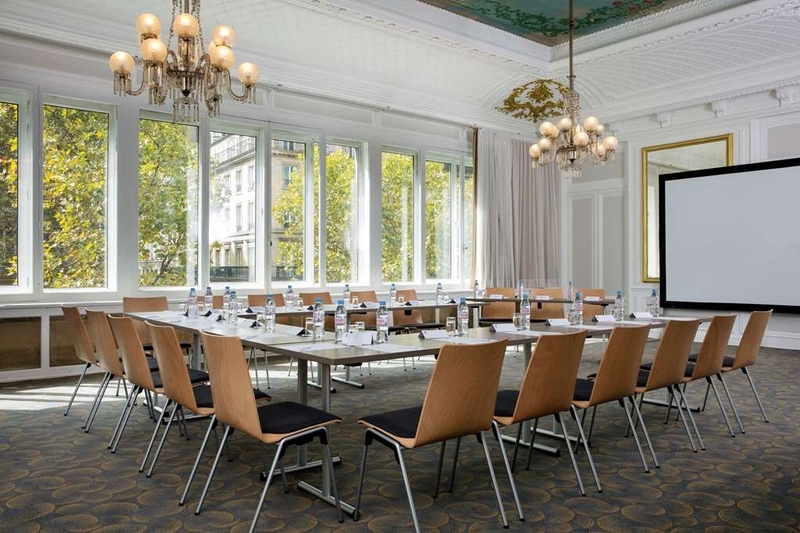 In a prestigious setting that dates from the beginning of the nineteenth century our rooms and our conference facilities become your best allies. Completely refurbished and sound proof all 130 rooms offer an elegant quiet and restful setting. The authenticity of the decor is mixed with today's equipment: free Wi-Fi connection, air conditioning, private safety box, mini bar, television with International channels, direct line telephone. Clean, warm rooms, super comfort bed, very kind and smiling staff. Fresh breakfast with variety of selection. Free keeping of lucugge. Spotted at central place with bars, cafes, restaurant, market all nearby. The good points: nice location, convenient to metro, restaurants and shopping. The bed was comfortable. Room was a bit outdated, but it is a historically interesting hotel. I realized that your experience is very different depending on which room you are in as I found out comparing notes with my colleague. The decision is yours. My room was warm and the thermostat was not working. Their thermostat worked. My desk space was quite limited due to the coffee maker and tv being on the desk. Their room had a nice long desk space with tv on the wall. My wifi worked without issue; ,however, their wifi connection was weak and constantly dropping to the point that they could not work. I am an early riser and several mornings the breakfast was not ready at 7, but later diners did not have an issue. I think this hotel has potential, but is lacking right now due to all the inconsistencies and lack of attention to details. Having an important business meeting, I decided to stay here. The hotel had no hot water this morning. So my shower was envigorating. The only thing the receptionist could do was to lower the bill by 10 euros and not even offering me a free breakfast. Not good. And it is above party places so.make sure you ask for a calm room -which I did get though. 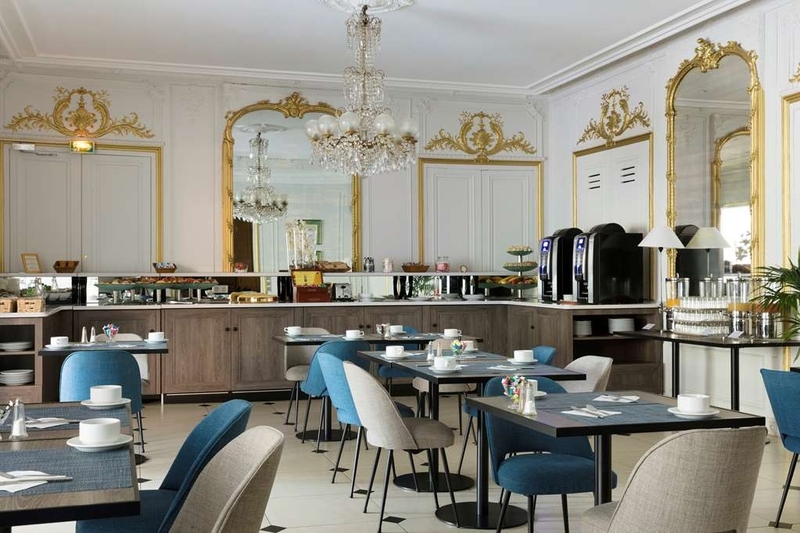 "Great location but pick somewhere else "
I have been to Paris a number of times and chose this hotel due to the area which is perfect for first time visitors and I was travelling with family who had not been to Paris before. First I will start with the positives in which there is only 1: the location. The location is faultless, the metro is right outside, taxi rank across the road, 2 hop on hop off bus stops are outside the hotel and there are lots of shops, restaurants and bars in the immediate vicinity. However the amount of negatives outweigh the positives. The staff are disinterested, they aren't rude but nor are they friendly and welcoming. There is a feeling they hate their jobs and don't want to be there and simultaneously dislike the guests. On the first day my mother was told to stand back so European guests could be given a croissant first despite the fact that she was first in line. Even then she was told she could only have 1 croissant. Since when were breakfast items rationed? I found a long hair in the cheese which I reported to the waiter who said nothing except took it to the kitchen. Breakfast was the same every day: bread, pastries, 2 cheeses, 3 meats, scrambled eggs, bacon, sausages, 3 cereals and fruit, it didn't change so quickly became boring. Items also ran out regularly and were either not replenished or took time to be refilled. The fire extinguisher in the restaurant was blocked by a table which I am pretty sure goes against safety standards. Tables at breakfast are cleaned by brushing the crumbs on the floor, again a health and safety issue. The website and in room information mention a bar and room service. The bar was closed and will reopen in January, same with room service. Whilst we eat out and rarely use room service, never have I been to a hotel where the bar and room services have been suspended over the Christmas period. The rooms are simple and compact which is not an issue as we are out most of the time. However the cleanliness seriously needs to be looked at. The shower was dirty and in need of some bleach, same with the toilets. Some days we didn't even have the room serviced at all even when we came back late despite putting the sign on the door. One day housekeeping walked into the room whilst I was asleep and the do not disturb sign was up. Dirty cups weren't removed, not enough towels were provided and the bare minimum was done in the room. Rooms are so hot that you can't regulate the temperature so have to open the windows to the constant traffic noise. The control panel lights up but it seems the mains have been turned off. The halls are often blocked with vacuum cleaners that are left there during the day making this a health and safety hazard. The clincher was finding that housekeeping had eaten some of our fresh cherries we had on the desk. Fast wifi is also advertised however it is painfully slow and drops out. I wish I had positive things to say about this hotel however I don't and I would expect a lot more from the Best Western name. Management, you really need to look at the way this hotel is run and work with your team who obviously don't want to be there. Location is hectic with a lot of retail around. Mostly chain places. Convenient cab stand across the street to make a quick getaway from this place. Entrance is just inside a passage way lines with so so retail. Dim lighting and a staff that does the bare minimum. Not an impressive start. Dingy, not well cleaned. Asked for a few extra towels but never got them. No cleaning the room either. Window would not keep closed all night and the rain and wind came in. Horrible. Terribly slow wi fi. Booked to stay at this hotel in my first visit to Paris. I was hidden in one if the most popular streets in Paris Montmartre . You had to take the elevator to go up to the reception . My first reaction was this is Paris. I later found out that it was an old Opera House and a writer was living there....Anyway when they gave us our room up to the 4th floor we were going and going through such small corridors to get to our room that it reminded me of the Greek mythology of Minotaur and the wool they that was left to lead the path out lavirinthos . Once entered the room was so cosy with a beautiful view of sacre au couer . The room was perfect clean with all the amenities and the temperature was perfect. The staff was helpful whever you asked for something. Even though December it was hot we did not have to open the heating on. It was perfect exactly what I would expect in Paris. In the area you can get everything you desire a very busy Street with lots to do ...from theater to places to eat shop and many things to vidti. The chocolate factory 509 ft away and place Lafayette just around the corner. I would stay in the area again definitely and I would recommend this cozy hotel at any time. The pictures on the website for this hotel are really misleading- the room shown is probably the only one like it. Our group of 7 had to look at many other rooms before having to accept what we were given as it was too expensive to go elsewhere so late. We were given a ‘preferential rate' and could've booked it 20% cheaper online. The smell of sewerage was throughout the corridors and rooms, a lot of the rooms very small and claustrophobic- also not cleaned properly. I took a video of me wiping the dust off a lamp but it won't let me upload. All in all really poor. Even had to rush having a shower as it wasn't running away quickly enough and started to overflow. Great central location but do your homework so you don't ruin your trip. "Not the quality I was expecting"
"Great Price via Hotels.com, Small room"
"Good location, good price, SMALL room." We stayed here for three days. The location was great. Close to metro and walking distance to many sites, shopping, and restaurants. Many restaurant choices nearby at many price points. Grocery store nearby. Neighborhood felt safe. Room was clean and hotel staff was friendly and helpful. Did not have the breakfast. There are breakfast options nearby. Recommend available shuttle to airport. Much cheaper than a taxi and more convenient than metro/train. Only "negatives"...rooms are VERY small and the walls seem to be paper thin. We could hear our next door neighbors coughing and talking. LOL But if that is not an issue for you then you will enjoy your stay. good location, 50m to the subway station, but rooms are small. we asked for a sacre coeur wiew room, the wiew was great but the room was very small. very typical european hotel. didn't have breakfast this time. Great location - lots of pulse and resources yet not noisy. There's a grocery store right in the building and the building is a fun "Passage"-type shopping area. There are restaurants downstairs and up and down the block and the Metro is so convenient - just steps away! You can even walk to The Louvre and Seine! Breakfast was more than we expected (eggs, sausage...) and the breakfast room Manager and server were friendly, hard-working, and patient. Rooms were lovely (comfortable, cozy wooden walls and nice big closets.) I believe they updated the rooms recently so everything was clean and loved the USB plugs. We would definitely return and stay here! Great value. "Nice room with air conditioning"
Good location for sightseeing, restaurants and metro. Comfortable room with air conditioning! Our room had the bed in a loft so if stairs are a problem for you, ask for single level room. Customer service could be friendlier and more helpful. Gate on the street is locked at night but we were not told. Need to ring bell to enter. This place is perfect for location, the front doors open onto the cutest little enclosed side street of shops! Food is within 20 meters and it takes only 15 minutes to walk to the gardens and the museum. Lots of great general shops in close proximity too. Felt fully immersed in French culture staying here! The rooms were spacious, we had a studio room with a view of the street. Was cleaned daily and the staff were friendly but not over bearing. Despite it being in the hustle and bustle, it was quiet at night! Will defiantly stay here again, modern and clean! "Great location but very small rooms"
The hotel is really in a great location but the room is very small as is the bathroom. We did not have the friendly staff that others have written about. They were not rude but they did not try to help us nor were they welcoming etc... I would not stay here again. My husband and I have just returned from a 3 night break in paris staying in this hotel. Really enjoyed it. The staff are friendly, rooms are clean and the location is perfect. We stayed in a room right at the front of the hotel. Yes,when we opened the windows there was a lot of traffic noise but we didnt mind this. I quite like hearing the hussle and bussle of paris. We had breakfast each morning which filled us up. Mostly continental however there was also bacon, scrambled eggs and sausages. The loaction is fantastic, walking distance to the louve and big department shopping center. The metro is great to use for getting around paris. And there are so many bars and restaurants to choose from. Would definitely reccommend and return to if we go back to paris. Thank you , We are glad that you had a good stay and enjoyed Paris! The location was fabulous - there are Resturants, Bars, Shops close by. The metro is close to the hotel and so is one of the stops for the Big Bus tours. I was traveling solo but I booked a room with a double bed because the rooms are on the small side. The room had the basic amenities - nothing special but comfortable. Thank you. I am happy that your stay was good in our estbalishment as in Paris. Generally satisfying. The room was very small and the bathroom could be better. It is an old building that has been renovated but it definatelly needs improvements. Breakfast was good with variety to choose. In an excellent location. It has everything just around the corner. (Carrefour, metro station, places to eat, drink and Hard rock cafe two steps away literally) . It's really central and you can reach on foot many famous monuments. The reception was really helpfull and kind. Thank you Marc Antony! "Clean place well priced "
The hotel was good the rooms were clean and had a comfortable bed, rooms bit small and basic but it was fine. we had street city views which were nice. Staff was very nice and helpful. I'd recommend this hotel its good value for money. Our first room was located underneath students who were above! we were exhausted from the travel and the noise was appalling. The WIFI in that room did not work at all and you couldn't feel the aircon. We had complained the next day. They moved us to a nicer room straight away, where the WIFI and Aircon worked. We were very happy. But... I recommend telling staff you do NOT want your room cleaned.. as a few silly bits were thrown. For example; a comfort label, I pop under my pillow was thrown and a full bottle of cordial which was from M&S. This was brought because my sister, who I went with will not drink plain water. I do think it was thrown because it was underneath the desk (located near the bin) but it was FULL. A little common sense could have been used or left until we'd left? When I had tried to retrieve it at reception, the man had said it would have been gone by now but gave us a bottle of juice instead which I had taken. To top it all off.. a lady let herself into our room at 11:20am asking if we were checking out. I replied with 'check out is at 12am?' She then said yes and left. I was very confused and annoyed. I felt like an utter nusense by the end of our trip. I would only ever complain if it was needed and with current and past work places, I will always do it politely but the staff were miserable and I do NOT recommend this hotel to anyone. The only benefit.. we were close to everything. Arrived at the hotel after a shortish bus ride from the train station. Hottest day of the year, and happy that the hotel let us check in early. Upon arrival we were told that only the 5th floor had Air Conditioning and all other floors were broken so we had to be put on the 5th floor if we wanted AC. Unfortunately, the elevator only went to the 4th floor so we had to ride to the 4th floor and carry our luggage up a extremely small, winding staircase with all of our luggage (miserable). Pros: the hotel was okay and decently clean and the location was very convenient. Cons: AC was not great, walking up the flight of stairs with all our luggage was awful, room was cramped and basic. I would stay here if budgeting and willing to overlook minor inconveniences. Myself and my husband were celebrating our 10th Wedding Anniversary and wanted somewhere central and reasonable in the centre. Ok so firstly there are some reviews on here that say the rooms are noisy but this hotel is in in central Paris and the area is bustling with activity! Our room was not facing the street and we had no noise but when staying in this area expect the night life to be busy. The staff were lovely and could not do more for us. Some practicalities - it is a brilliant location for the M1 metro with the grand boulevards station just on the left as you leave the hotel. We purchased a 1 day ticket for 7.50 euros. The open top tour bus is also just on the right when you leave the hotel so another really convenient spot. There is also an M&S foodhall right outside the hotel in the passageway so tip if you only like a cup of tea, get some milk from there as they don't supply this in the room. We had a fridge in there and the minibar to be fair was very reasonable. The rooms and beds were cleaned and changed daily even though we only stayed 3 nights. Breakfast was ok but additional charge so the choice is yours. There are numerous cafes and patisseries on the street though. I would definitely stay there again as this hotel has so much French charm and is quirky as well as having a brilliant location! "Nice depending on the room"
We originally were given a room facing the street and, as it turns out, over an Australian bar. There was some noise during the weeknights,but it was tolerable . . . until Friday night. My friend and I literally did not sleep the entire night because people in the outside area of the bar were screaming all night -- not talking loudly, screaming until 6 a.m.! We complained, and the hotel was responsive and clearly was aware of the noise issue. We received another room (which was somewhat difficult because we had twin beds), and that room was absolutely fantastic. Hotel is very conveniently located, with two metro stops, a little grocery, and a number of restaurants within a block. It is a bit old in general (but priced accordingly). However, the bathrooms were nice and modern, and the rooms clean. I would not hesitate to stay there again so long as I could be assured of a room which was not on the street. "Good location but poor facilities and attitude"
Stayed here at the beginning and end of our time in France with a group. The staff were vague and unhelpful about most things from luggage storage, check in, providing housekeeping and directions. No one on reception seemed to know what the previous shift was doing. There was a young man who was most helpful with broken luggage though. The most disturbing thing was that a man checking the mini bar late one afternoon barged into the room despite being to loudly and clearly that I was showering. Frequently the very narrow corridors were blocked by by linen and housekeeping trolleys making moving luggage impossible. Many of the rooms are extra tiny and badly laid out with no bedside tables, uselessly shaped cupboards and nowhere to put suitcases. One person could not fit herself and her suitcase in the room and was told her suitcase was too big and she was too fussy. All up it was not a particularly lp,easy to stay. There are much better locations and hotels for the same money. Lovely short visit in a good central location very close to the Metros. Hotel comfy enough for a three star with tea&coffee tray, fridge, free Wifi, AC and use of safe in room. Room cleaned with fresh towels daily and shower & bath with toiletries supplied. Good breakfast choice in a pleasant dining room. Hotel staff very friendly and helpful. We would use this hotel again. "Spacious and quiet room with hotel located between two metro stations"
I selected this hotel after doing quite a bit of research on price vs room size, and location in Paris. This was my first trip to Paris. From CDG airport, we took the Roissy Bus for 12 euro to the Opera metro station (a little over an hour). It was about a ten minute walk with our luggage from there. 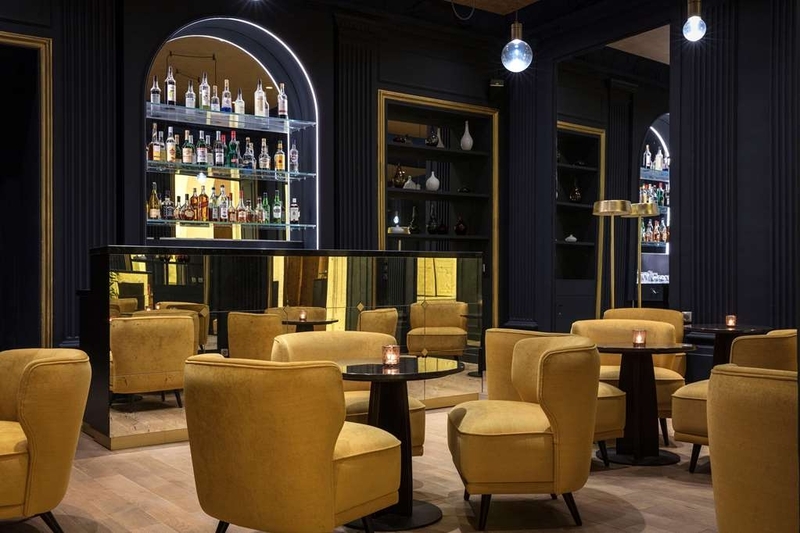 The hotel is located in Passage Jouffroy, which is on the same block as the Grands Boulevard metro station, and a little over a block from the Richelieu-Drouot metro station. The check-in process was very quick, and the front desk staff both spoke English. The reception desk is located on floor 1 (second floor), and was much nicer than I expected. Our room was on the floor 2, and it was nice the room key was needed to access our hallway from the stairway/elevator area. Room was larger than expected. I was amazed as to how quiet the room was even though we faced the busy road. We also never heard any noise from the other rooms. The king bed was very comfortable. Everything in the room was very clean. Room had all of the standard items such as free wifi, large LCD TV (there were 3 English channels), and small fridge. We opted not to get the breakfast. Gate to Passage Jouffroy gets locked at 9pm every night, so there is a button to call the front desk for them to remotely unlock the door. The passage has a convenient store next door as well as a great sweet shop. Along Boulevard Montmartre, there are a bunch of restaurants (McDonalds to bistros) and a grocery store a few blocks away. It was about a 15 minute walk to the Louvre (no convenient metro to Louvre from the nearby stations). We took the taxi to CDG airport due to the weather, and it was 56 euro. I will stay here again next time I am back in Paris. Close to Grand Boulevard metro this hotel s well located for access to all the major attractions. It is also surrounded by bars and restaurants. I booked a small room as I was travelling alone, it was clean and had everything I need for my 2 night stay. One of the quietest hotels I've stayed in. I though breakfast was over priced, and with the location would get better value for money eatting breakfast out, but this would be my only negative of this hotel. All in al Il had a great stay and would stay here again. "a great base camp for exploring Paris"
This hotel was great. Mont Martre is an amazing area to stay. It's a quick walk up to Sacre Coeur and if you are walkers like my wife and I a really great base to see the rest of Paris. We did 44 Km on foot in two days walking down to the Eiffel Tower twice. Take the Roissy Bus from CDG (12 Euro each) and it drops you off walking distance from the hotel. We had a wheeled suitcase each and had no trouble. It's also right beside the Grands Boulevard Metro stop. There are really nice restaurants around as well as a McDonald's and a Hard Rock Cafe if you are missing North America. Breakfast was great, nice European style, there was something extra good about the orange juice...I know weird but be sure to have some. The room is a typical European sized room so it's not what you might be used to travelling from North America but it was big enough for us to get around in and ours had a great view of Sacre Coeur. "Hotel OK but very noisy"
I booked this weekend break through the Guardian/Superbreaks. Everything has been fine and the hotel is fine with a nice breakfast. However, the nights have been very noisy and sleepless due to a music venue at the back of the hotel. It is worse than Ibiza!! The hotel staff have been sympathetic but unable to do anything. I understand that a city break will have environmental noise but this has bordered on ridiculous. "The location and the Hotel was absolutely wonderful"
We had seven wonderful nights at the Best Western Hotel Ronceray Opera this was situated on the main theatre district and we were above The Grevlin wax museum . Every morning we had a beautiful full cooked breakfast smorgasbord board and our room was nice and clean with a nice view from our window, also the staff were very helpful even speaking a little English. The hotel is 15 minutes from Gare du Nord station. 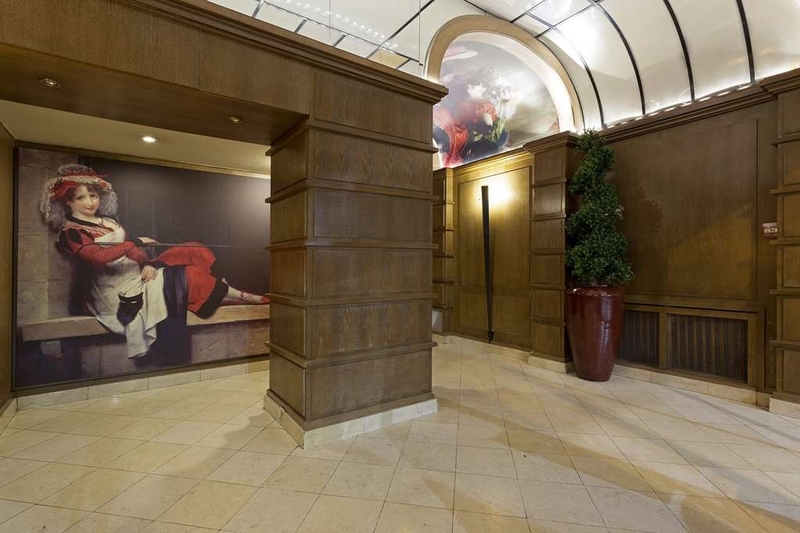 Its located in a passage way,lift is small and reception is on the first floor. The check in was easy,we asked for a room next to our friends,and she obliged With a room on the same floor a few doors away from each other. City tax is €1?65 pppd. Our room was at the back,which was great very quiet. Our room was much bigger than I had read previous comments about room size Bathroom was a good size very clean,only gripe was the shower settings from hand shower. to above head shower,trying to get hot and cold was a bit of a procedure. Coffee/tea making facilities replenished every day when needed. Place a bit dated could do with a lick of paint.. Breakfast was not to bad cold and hot delights,machine coffee/tea... At times very busy...but no problem. Metro just outside. Plenty different restaurants all around hotel.. So all in all a great 3* hotel great service,room clean and nothing was to much trouble. Just be careful with the stuff you leave at the room. I stayed in this hotel for two days the first week of February for business travel. When I returned home I realized I had left my jeans (nothing special but just a 70€ Levi's). After several tries to get some reply they called me back saying they had not "found" them. Bad experience with housekeeping that overshadows other good things that the hotel could offer. Booked this as a lovely long weekend, as a package and a great weekend to escape the snow in U.K., luckily managing to change Eurostar trains. The location is fab as near to metro but great for walking lots to see and do. The hotel itself must have larger rooms but knowing it was on a main road we did ask for a quiet room, 3rd floor (renovations on 4/5 although you wouldn't know) I think it was slightly larger than a cabin on a cruise ship but only just! But very compact it did have everything you needed. Great comfy bed, nice bed linen, very clean and great ensuite with good bath and rain shower. Just a little more room would have made it more comfortable... having to put the kettle on the floor to plug in didn't seem right! Still breakfast was very good, hotel was fairly busy but both continental and hot cooked buffet was plentiful. One complaint was the queue for the coffee, children getting hot milk from it on their cereal slowed the q, but the cafe au lait was lovely. Simple check in too. So all in all if you get a package deal this is very good value, just don't expect a huge room unless you request/pay for suite. Would I return, probably if on a shopping trip etc as the location is great too. This place had a great location, Paris is very spread out so this is right in the middle of everything. Very narrow hall ways but staff was nice and rooms were clean. Right outside of the hotel great restaurant. Chocolate mousse AMAZING. View from hotel. Come book this place again. Nice hotel and very confinience. Place in the citu center thats is awesome. Just beside the hardrock cafee and metro thats perferct to mobile. Room is clean and safe staff are kind and wlecome. The provide sattle bus to the airport. Booked a last-minute deal through go-today.com & this was one of the hotels offered ~ read reviews & this indeed was a GREAT location to get anywhere in the city ~ the Grand Boulevards Metro is literally less than 200 feet from the hotel ~ and with the app “Next Stop Paris” you can easily navigate to major attractions! The room was small but clean & the bath had a tub/shower plus hand-held wand. WiFi, safe, TV & mini refrigerator all fine. Only challenge was having just (1) outlet in the bedroom & none in the bath ~ so we had to juggle phone charging, curling irons, etc. Breakfast was consistent throughout the week ~ nice selection of hot & cold items. A solid economy hotel well-suited to business travelers, student groups & budget vacationers. Many wonderful restaurants within easy walking distance along with the distinctive stores at Galleries Lafayette. Staff was pleasant & accommodating ~ English-speaking for the most part. A great value & would consider a return. A wonderful hotel on the boulevard Monmartre. The Paris Nord train station is only 15 minutes away and a walk into the city center is something around the lines of 20 minutes. The service is very nice, the rooms clean and the breakfast understandable. Nearby are around 3-4 grocery stores, several restaurants and cafes. The La Fayette is about a 15 minute stroll away. Loved it!!! Easy to get to by metro and in a busy restaurant area. Surprised by the full breakfast. Our room had a lovely view of sacre coeur which was illuminated at night. Clean comfortable and quiet. We were also told about the famous brasserie around the corner where we are five nights in a row! Beautiful location just a short walk from many restaurants. Easy transit access to go anywhere in the city. Room and bath were spacious and updated Staff was great with assistance in any way we asked. Morning breakfast Buffett and bar in evening. Would stay there again. A group of 4 stayed 2 per room. The staff was super helpful-everyone spoke English, the room was pretty small, but clean and the shower was hot! The location was great, 1/2 block from the metro and super close to the hop on and off tourist bus pick up! "No shower and broken amenities"
The location was great, but the hotel room was very lacking. The hotel smelled of cigarette smoke most days despite the non-smoking rooms. The hotel was having trouble with magnetizing the key cards, so we had only one working. We had no shower other than a hand held shower head and no shower enclosure. There were no wash clothes or toiletries provided the entire stay. The hair dryer was broken, so we had to borrow one from the desk which could only be plugged in outside the bathroom. There was a lovely rooftop deck which would have been great for us except that the door was jammed. No coffee maker, only an electric kettle. The room was spacious except that they left a fold away bed in the room that we did not need. We would have been better off in a smaller room. "I GOT STOLEN IN THIS HOTEL"
I got stolen from.the security box in my room. This was not the first time it happens in this hotel. Be aware because it seems the staff is align with the thieves. AVOID THIS HOTEL. AVOID THIS HOTEL. AVOID THIS HOTEL.AVOID THIS HOTEL.AVOID THIS HOTEL.AVOID THIS HOTEL.AVOID THIS HOTEL. Very good hotel, near a metro station and in a good neighborhood in the center of Paris. Our room was a triple room with a huge double bed and a single bed. It was very spacious. The bathroom was spacious, comfortable. The room was clean and it was cleaned daily. Breakfast is served in a beautiful place and is quite rich. The hotel is in a Tourist area and near the Paris Opera House. Is close to metro station so make other area of Paris very accessible. The hotel itself is old and the lobby is on the first floor. The staff were helpful and friendly, room was adequate and clean. Only meal available is breakfast but numerous restaurants very close by. Went to 2 for the evening meal and both were good. I visited this hotel in early July 2017 so in the height of tourist season. The location is perfect!!!!! its a 7 min taxi ride from the lourve, there is a train stop infront of the hotel and it is in a major city area with several stores and restaurants. You can walk to the hotel from the train station, its about a 15 min easy walk. Beware the hotel is in an alley way, its not directly on the street, its not sketchy its an alley way with cute stores and restaurants it pretty cool. The hotel room is small. We stayed in a queen bed but the bed basically took up the room we had to squeeze to get around and we are average sized people. For example we could not at at the desk it was too close to the bed. The bathrooms are spacious! "Fantastic hotel with great service and Breakfast!" We had flown early in the morning after flying in from Sydney, Australia. The hotel were fantastic and accomodating and allowed us to check in early as our room was ready. They were super friendly and chatty, this was rather comforting. The hotel is in a great location in the opera district and was a short walk to almost everything! We spent a full day exploring Paris and came back to our clean, comfortable and sizeable room. The next day we had a fantastic breakfast and coffee in there restaurant. We would stay here again and recommend to all! I have just had my third week long stay in the Hotel Ronceray in just over a year. The first time was a shot in the dark, even the room, but after that it was my first choice of hotel and I book well in advance to have the same room. The staff offer me an upgrade but why should I move? My room is a single but with a large bed; the bathroom is large albeit with a very small shower cubicle, probably not good enough for most people; I am on the 5th floor and the lift stops at the 4th; it is the room furthest away from reception and the dining room and that is why I like it! Oh, the view from the window is stunning, looking over the Parisian rooftops and towards Le Sacre Coeur. It's a wonderful view by day, and by night, with the dome of the church lit up, it is breathtaking. I have read most of the reviews of this hotel and have been surprised by the negative comments. One speaks as one finds I suppose. I find the staff to be welcoming with every member greeting the guests with the traditional "Bonjour Monsieur/Madame." I walk through reception to go to breakfast and notice that every guest is greeted in a friendly manner. Let's deal with breakfast. There is a great choice at the self-service buffet and everything that I have had has been fresh and tasty. The purists would say that fruit salad in a hotel ought to be freshly prepared rather than tinned but that is a minor point. The dining room staff are attentive and courteous, keeping the place clean and tidy. The ambiance is delightful. Guest know that the hotel does not serve meals other than breakfast but within yards there are plenty of places in which to eat. Guests who want to take food out for the day can visit the newly opened M and S Food store virtually opposite the main door, or even better, turn left onto the main street, take the first left again and buy from the local Carrefour mini-store. For evening meals try the restaurant directly opposite the main door and have good food at reasonable prices and served by thoroughly professional French waiters who are a joy to watch. As I have only used one room I can only speak of that. It is spotlessly clean and is looked after each day. Frankly I could't care if my towels were to last for a week, as they do at home, but in this hotel mine are changed every day. Good quality toiletries are kept topped up. The bed is comfortable and the modern television is easy to use. I prefer to sleep with windows wide open but this time, on one evening, there was the sound of distant partying (not in the hotel). I closed the windows, thereby soundproofing the room, and switched on the air conditioning. It works well. My room has a perfectly good working room-safe and I leave everything in there, even my snacks! I use the excellent fridge for the storage of my own drinks. This hotel is ideally placed. 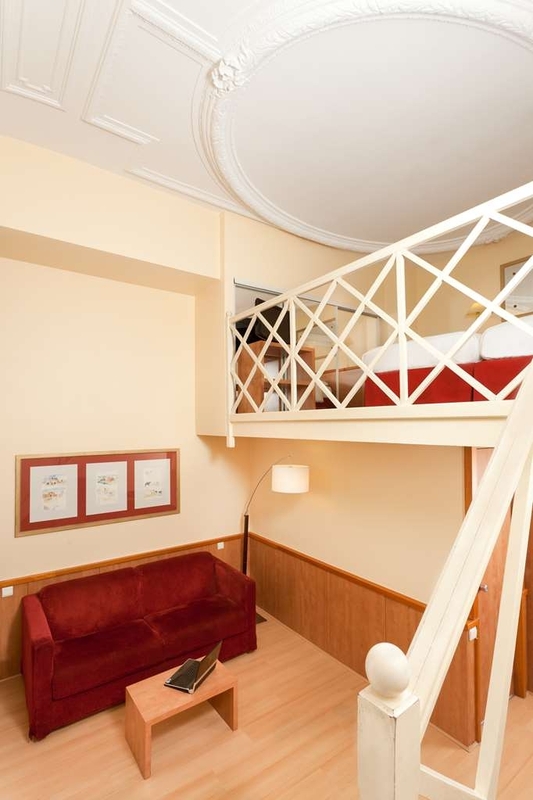 Guests are fifty yards from the Metro or within walking distance of the Opera, the Louvre etc. If taxi drivers don't know it passengers can always ask for La Musee Grevin, just next door. Ever driver knows that. Tips: when you get off the Metro head for Sortie (Exit) 2 and you come out fifty years from the hotel. If you are spending five days or more in Paris get a Paris Visite Card and have unlimited travel on tubes and buses. The current price is about 37 Eu. Wander through the three covered passages. The hotel is situated in the middle one. On a balmy evening hop onto the tube and travel a few stops to the Trocadero from where you can look across the river to the Eiffel Tower and enjoy the street entertainers. Last of all, please don't try to find my room so that you can book it for yourself! I love this place! If I might plug the travel company which I use and which has link to the Hotel Ronceray? One call to Superbreak and my room and Eurostar ticket are sorted for me. That's what I call service! "Short break away to Paris "
Came to Paris on a Eurostar included short break (4 nights) with my elderly mum. Taxi from gare du nord to hotel which even the taxi driver couldn't find .... the entrance is down an alley which later is found to be very quaint. We checked in and were given a fourth floor room with a bath .... ok for me but not for mother and when we spoke to reception/concierge they quickly and efficiently moved us into another twin room with a walk in shower. The boulevard de Montmartre is very busy and noisy if you have a front facing room. The noise did not stop all night so thankfully the air con in the room worked and we shut the windows. The rooms we had were small but efficient. The maid came in daily and we had fresh towels and bedding every day. Everywhere very clean. Beware smelly fridges ..... Breakfast pretty good with wide selection of both hot and cold selection. Both continental and English choices. Only a couple of negatives about our trip - firstly the people. Apart from 2/3 very pleasant and friendly concierge staff at the hotel the rest are seriously rude. No customer service skills. Miserable. Obviously have issues with British and anyone visiting this beautiful city. We found it all very expensive both to sight see and to eat. The Roncerey Opera has a small bar which is only open Monday to Friday and the bar man needs lessons in customer service. It does not open Saturday or Sunday. The only food is breakfast. They do not serve anything else at all. All in all an ok stay. It was NOT a cheap short stay break which is a shame. "Might be the worst hotel I've ever stayed in." I stayed in this hotel in July 2017 for a business trip. It was so awful that I changed my plans to leave early. First, the good, what there was of it...The hotel is an unbeatable location and was very convenient to everything I needed to do. Some of the staff were very nice. Now, for the bad. Oh boy, where to begin with the comedy of errors in this hotel. Maybe I'll just list it: - The hotel itself is very shabby, and the rooms are dated looking (though the bathrooms aren't bad). - I was moved after my first night because I wasn't assigned the type of room I reserved. My new room had a broken air conditioner and some of the staff seemed put out that I wanted a room with functional air conditioning in July. - I put my Do Not Disturb sign out, and the cleaning staff repeatedly ignored it and cleaned the room anyway. When I complained, the staff acted like it was somehow my fault for not also telling the front desk that I didn't want my room cleaned. That's what the sign is for! That's Hotels 101! - The "free wifi" didn't work in my room. I was so fed up with complaining to the desk that I didn't even bother to bring this one up. - The beds are beyond tiny and uncomfortable. - There's no space in the room. I felt claustrophobic constantly. I guess this hotel might fit a need for some people who are price-conscious and don't care about things like terrible service and privacy violations, but it wasn't a good experience for me at all. "Best Western Hotel Ronceray Opera - Adequate Hotel for the Price Conscious"
I stayed at the Best Western Hotel Ronceray Opera for four nights from June 23, 2017 to June 27, 2017. Positive aspects of the hotel are as follows: air conditioning works well; low price relative to other hotels; convenient to Metro; cleanliness of room; convenient to supermarket (M&S) which is 30 feet away; convenient location; WiFi worked great; and great view of the Sacré-Coeur. My room was very small, but likely I got what I paid for ($149 euro per night which included VAT). Negative aspects were: if you have status at Best Western (I'm the highest level), it doesn't mean anything and doesn't get you anything; the was a 2-3 inch gap where the shower door opens and the shower door leans in about 6-8 inches so water flies out of the shower; and on Saturday night a nearby extremely loud "popup" disco until 5AM the next morning (the desk guy told me the next morning sometimes a nearby hall has these events so according to him it isn't every Saturday night); and there isn't any amenities in the hotel aside from a free newspaper and tea/coffee in the room. In giving it a rating of 3, I have considered the price I paid and the category hotel it is. In sum, if all you need is a clean room in a convenient location and don't want to pay that much, this is your hotel. This hotel is very conveniently located right on the Big Bus blue route. Easy to start your day exploring Paris with Big Bus hop on- hop off service. The hotel manager has been extremely helpful with directions and also excellent recommendations for dining. "Everything We Needed and a Bargain"
Had all of the basics down pat at a great price. Clean, very well-located, friendly and helpful staff, free and reliable wi-fi, comfy beds, black-out curtains, spacious bathroom and newly renovated, all located above one of the most charming covered passages in Paris and a lively (but not too lively) strip of Parisian nightlife. We were very happy with our stay here and would stay again. "Odd entrance, nice split level room"
Picked this Best Western based on price for the location, and was not really expecting too much. Entrance is into an arcade off the main Boulevard, but once you've found your way in then things improve. Reception staff are very helpful and pleasant. My room had an odd mezzanine floor for the bed, but that did make the room feel pretty spacious. It was clean and OK from an equipment perspective, but a little tired looking in places. Breakfast was limited choice, but quality all OK and good value. Great location. Once you come down from the hotel, it's a busy street with different kind of restaurants, bakeries, shopping area and metro stations. It's close to Louvre. The rooms are okay Their breakfast buffet is excellent. We stayed at the Best Western with a party of 9 and 4 rooms. Hotel was very clean and nice. Rooms were large for European standards and had all the amenities, including air conditioning! Breakfast was included and was fantastic (yum, pastries!). Staff was very nice and accommodating. Overall a very nice place, would definitely stay here again. A good location, walking distance to Opera Garnier and Louvre, close to the metro station, many small restaurants nearby. The reason for the low rating - the mattress in our room really surprised us. We didn't expect to find such a mattress, which offers no good support for you back, in Best Western hotel. The double bed was on a small side ( no, we are not overweight), and with this mattress you really cannot stay on your side of the bed and sleep comfortably. The was a month long trip, many cities and several countries, and the bed was by far the least comfortable on this long trip. Good positioned in the center of Paris. Many places at walking distance. Older (Asian?) lady working at reception could be friendlier. We never had one good morning or even looking up when we pass by. Seemed rather uninterested. Rather unacceptable when working in a hotel... Had one very friendly middle aged man working at reception offering a coffee while waiting. People working at breakfast were friendly. Cleaning staff also. Satisfied with the room, bed, bathroom etc.. Breakfast could be a lot better for the high price!! Overall, it was ok for us. The hotel has a nice location inside the Passage Jouffroy, Blvd Montmartre. It seems however a little bit old-fashioned (especially the breakfast area) but the room and the bathroom were clean. The hotel would deserve a score of 3 out of 5 but for the nice price I prefer to raise one point more. "What's not to like? This hotel is perfect!" I was on a business trip so I was looking for a hotel in a nice, central area, close to the metro. This hotel met my expectation to the full; From the moment you walk in, the pleasant and polite people at the reception welcome you with a genuine smile. I also loved the decoration of the ground floor; the floor matched perfectly with the accents of the walls, while their decor completed a harmonious atmosphere. The room was small, but this is normal in Paris. It was very clean and the bed was more than comfortable. Loved the morning breakfast buffet and all the friendly people who work there. Siete bravi! Really great hotel for an amazing price. We had a lovely, spacious room with a fantastic view of the street below. It's situated inside a lovely shopping arcade which we absolutely loved- was very unique, but also very safe! The surrounding area was very lively- plenty of bars and restaurants that are open until late. The hotel staff were fantastic and gave us lots of information on getting around in Paris as well as some discounts off a bus tour and river cruise. Breakfast was high quality and varied. Only negative was that there was no wifi available in the room. Overall would definitely recommend this hotel and would say it seems closer to a 4 star than a 3 star. "Great hotel with a view!" This hotel came with a groupon package & we didn't have high expectations because it was a Best Western & we got a good deal but this hotel was great! We had a beautiful view, bathroom was great size & beds were comfy! Definitely would suggest! This hotel is in a old building. once arrived you need to walk into the passage to find the door to the lip which will take you to first floor the hotel lobby. This passage is call Librairie Du Passage. You can find another passage( arcade) at the opposite building which have many cafe and restaurant . The underground train station is only 2 door away (grand boulevards). You can also find many cafe and restaurants around the hotel. Just like Le bouillon Chartier a restaurant 2 min away from the hotel. Come out from the hotel turn left, just walk and follow the building ,at the corner turn left , pass by few shop you will be able to see the restaurant. Hotel condition is clean and breakfast good, Staff friendly and helpful. This is the second time we have stayed here and we cannot fault it. The room was very nice and looked like it had been refurbished. Breakfast was okay and the staff were helpful. Lots of bars and restaurants nearby. Great location. Very small room. Very nice craw. Clean and comfort. Free Internet connection at good speed. Good food around the hotel. But no parking. In the romantic there visit a USB change power supply. This is an old hotel hidden down an arcade. The neighborhood is alive with action and restaurants and there is a metro station right outside. But the décor inside is dated and tired. But it was clean and comfortable. We stayed there as a group of colleagues for a company event. Every experience and every room was more horrible than the other. Rooms are small, old furniture, so very dusty, and with no sound proof. You can hear everything happening next door or the hallway. There is a constant buzz coming from god knows where anyway. The bed is like a torture device. Reception and room cleaning service is average. The elevator broke down twice in 5 nights we stayed. Wifi is on and off all the time. The "breakfast" is nothing but poor. The only good thing is the location but there are other hotels nearby anyway. Pros: Great Location, close to metro and also in walking distance to Louver Museum surroundings. Great free WiFi Good A/C Fast hot water Working hair dryer Comfortable bed & covers Good service (room service and reception) Luggage storage service available in case they cannot give you early check-in/late check-out Cons: Narrow Corridors Small rooms Pros will surpass cons if you travel light and don't intend to stay in room for much of your time, after all it is Paris and you should be outside! We would stay here again, when we come back to Paris next time. My friend and I, we booked the Best Western just as soon as we met at Gare Du Nord, as we were looking for the cheapest prices on the day of booking. So, after balancing price levels and geolocation, we decided that Best Western was the best option. The hotel is situated near the metro and not far away from the train station, which is rather comfortable for Eurostar or TGV passengers. When we arrived in the hotel, they gave us a requested standard room and when we walked in, we realized that the shower's door was literally out of the shower and could possibly fall on one of us, during our water procedures:) So, I walked to the reception to inform them of the broken equipment and they upgraded us , giving the biggest room in the hotel with enormous bed and 2 sofas and 2 separate bathrooms for same money, making our permanence in Paris very comfortable. The room was very nice with a sofa-bed for the kid on the floor level and a bedroom on a higher level. Breakfast has a modest selection. Fruits were scarce and never replenished. Bathroom was never cleaned and missing hangers. Towels were just folded and placed in their positions again. Never replaced in a 5 day stay. BEWARE! "Comfortable, great view, and great locations"
I loved this hotel, everything was perfect, the reception was very kind and well organized. The breakfast was okay but not "wonderful", still it was not bad. I would recommend for people who want economic choice when visiting paris. My partner and I spent 4 nights at the Ronceray in July 2016. We had a great stay from the welcome at reception on arrival to the genuine "Thank you for staying with us" on our departure. The staff were friendly, the room was great (as was the air con), excellent breakfast and fantastic central location. We will definitely choose the Ronceray on our next visit to Paris. The location of hotel is very good as all the best places in Paris are nearby (walking distance - if you consider 3-4 kms as one). Grand Boulevard is the nearest metro. The rooms are small. The staff is quite friendly. (I generally find the ladies are more friendly than the men). The path to my room was quite narrow. Lots of cafes nearby. For people who prefer Indian food, Gare du Nord is about 3kms. For others, you will find everything nearby - McDonalds, Starbucks, Paris cafes (every nook and corner). "Outstanding location and front office guys"
My wife and I stayed at the Hotel Ronceray in May 2016, when we needed two weeks' accommodation on short notice in Paris. The manager and staff could not have been more helpful in finding us a suitable room, which was spacious with plenty of storage for our clothes and baggage, and a very comfortable bed, all at a most reasonable price. 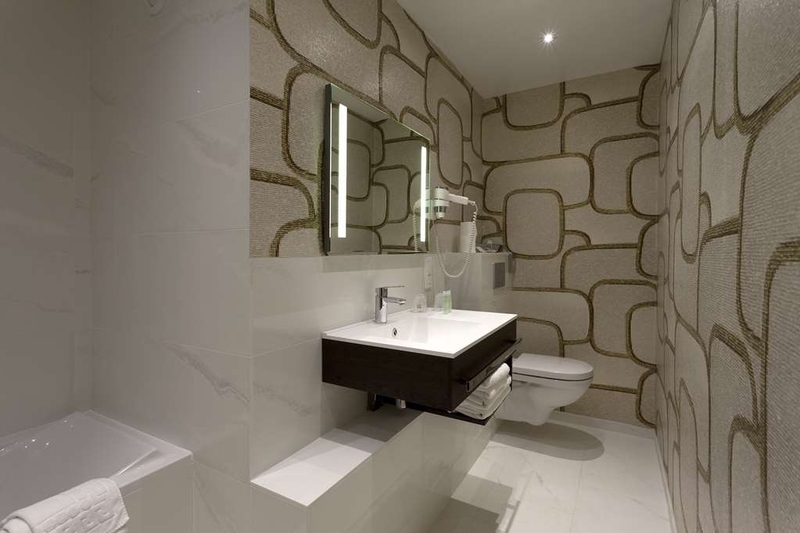 The bathroom was roomy, modern and functional, and servicing of the accommodation was friendly and thorough. Breakfast was available in the room when required at no extra cost, and although the hotel does not serve evening meals, they can and did make arrangements to supply us dinner from a nearby restaurant in our room when we needed it. All the desk staff spoke good English and were very helpful with advice and directions. The hotel is in a good location about 10 minutes' walk from the Opera Garnier . There are plenty of cafes, restaurants and small and large shops nearby, and it is well serviced by the Metro and various buses to all parts of the city, including a short ride (or a healthy walk) to the Seine and the Louvre in one direction, and to the Moulin Rouge and Montmartre in the other. A pleasant little bonus is a view of Sacre Ceour from the staircase and some of the rooms. Entry to the hotel is actually from the Passage Jouffroy, one of the atmospheric arcades of Paris, full of charming speciality and novelty shops. Overall, the Ronceray was a very comfortable, pleasant and convenient hotel in a very good location, providing excellent value for money for a three star hotel. Ok the location of this hotel is one of the best, near the Passage, about 2KM from the Louver, walking distance to anywhere, near the opera, there is no argument about the location. But the rooms were shaggy and old, BUT the renovated part of the rooms and it is not the Marriott, but really nice clean, no shaggy carpet anymore, bathroom all new. great surprise and I loved the room. the only con, for a business room is lack of enough electricity sockets, but will defiantly come again! Air-conditioning didn't work we told them 3 days in a row and they didn't bother to tell us why or if they will fix it. We had 4 nights there in the hotel and they didn't bother to tell us if they even tried to fix the aircon or why it still wasn't working. Only by the third night did they give us a fan to keep us cool. Couldn't have the window open to cool the hotel room down as the street was so noisy. You constantly hear cars and scooters beeping their horns and then yet another police siren. The list goes on. Some of which isn't the hotels fault but they could at least have kept us informed as to why the aircon wasn't working. There was free wifi but the signal was so bad that it was unusable by the desk and by the bed. I had to sit right against the room entrance door to receive an ok signal and actually be able to browse the internet. The door didn't shut properly so the cleaner didn't close it properly after leaving the room during the day. The shower flooded all over the floor. Could only open one window of the two in the room. There was much to be desired. I won't be going back there. "Location Only Positive About this Hotel"
Not sure where to begin regarding this hotel. The only good thing really is it's location, in the well known Passage Jouffroy, across from another Passage and a few blocks from Galeries Lafayette and Printemps. Aside that, the rooms are tiny given the price, the AC barely worked, the street level noise was louder than expected (and we/I am fine with street noise), the various front desk staff were impatient, less than attentive and confused about our asks on several occasions (typical guest requests like fixing the AC or an extra pillow), the breakfast was a joke, the room keys worked inconsistently. I could go on, but why bother. Note to self and others, pay abit extra for a nice hotel with more reliable and even service. "Expected more for the price"
The room was ok just a little small for my liking. The bathroom shower had no curtain and water would get all over the floor with no way to block it. Couldn't really communicate well with staff only spoke a few english words. Glad I only stayed for one night. This is a unique BW in a pretty good location. Each room was very different. I traveled with a class, so it was interesting to see the different setups and décor. I found that there are no showers and the bathtubs were sometimes very narrow. I'm like a size 6 and my hips were pretty tight in the bath. Probably wouldn't recommend for wider individuals. I actually stayed here in January of 2013. We are almost finished our 12 nights (May/June 2016) at this hotel on the Boulevard Montmartre. This is a great area as a base for seeing Paris and it's surrounds, with good access to the Metro, the hop on hop off buses, and organised tours. The area abounds in cafés, restaurants, shops (including souvenir shops), and small grocery shops. The reception staff are very friendly, knowledgable and helpful regarding where to find services and how to get to places - they have made our stay very pleasant indeed. Our stay included buffet breakfast each morning, with a good variety of food and drinks on offer. The rooms are on the small side (but adequate) so we were glad we had booked separate rooms, especially for a stay of 12 nights. Occasionally the housekeeping misses a beat (eg forgetting to leave bathroom supplies) but a call to reception sorts that out very quickly. My room didn't have a tea/coffee tray (with electric jug) or a chair when I arrived, but these were supplied promptly upon request. And there is a small refrigerator in the room, which is great for an extended stay. "Lovely hotel, good location and ideal for exploring Paris." The hotel is well situated, very near Grands Boulevards metro stop and within easy walking distance of the beautiful Galaries Lafayette. The hop on hop off tour bus stops nearby and there are lots of places to eat including the Hard Rock Cafe, Chipotle and McDonald's. The hotel rooms are a decent size, we had a twin room on the 3rd floor which overlooked the main street. It included a small fridge, tea and coffee making facilities a spacious bathroom (with a great shower) and a hair-dryer, Breakfast was very good with enough variety to suit most people, hotel staff were friendly and helpful and we would definitely stay here in the future. "Great location and price for visiting Paris, France"
Mid-grade hotel in the heart of Paris, easy walk to many sites as well as several Metro stops. Excellent breakfast served daily. This is not a luxury property but it is a great value property. Our room was small but adequate, a bit dated, but clean and safe! Front desk staff was always warm, friendly and helpful! Non-smoking rooms are available. "Good choice in the city centre of Paris"
The hotel rooms are very spacious by the normal standard in Paris. It is located on a Main Street in the city centre but you don't hear much noise even though staying on the first floor. The staff are very friendly and helpful. The breakfast is basic but value-for-money. It is a very nice choice. "Great Location, Staff and Service." As a University Faculty I regularly travel from the USA with a Group of Students to Paris. The Ronceray Opera is will always be our place to stay. It is located in one of the best location I know. The entrance being in the charming Jouffroy Arcade makes the Hotel even Special. We have access to what all visitors would need, the subway is a few steps, as the restaurants and cafes, etc... The Staff is really great and helpful, the Service is quick and the morning Breakfast Buffet helps you start a great day. Wifi is free and fast. "Cleanand nice hotel... good location"
Excellent location - right by the metro station, very friendly staff, clean rooms, great view especially from 4th floor! Mustafa is a star.... very helpful gentleman! Very good location ... provides easy access to everywhere. Definitely recommend! Lovely hotel, in walking distance of many tourist attractions like the louvre! 2 metros a stone throw away, would suggest downloading the metro app if you are planning to use them a lot as this helped me and my other half on our stay! Hotel is clean, staff are friendly! Would definitely recommend this hotel! Plenty of places to have food and drink within walking distance, would stay again! The hotel is in a great location, Right next to a metro station surrounded by plenty of shops and cafe's and only a 10 minute walk from the louvre Museum. The hotel was very safe with a locked door and gate that closes at night time. The room was modern and clean with a nice clean bathroom too, Had nice patio doors for light with a view of the Sacre Coeur if you looked out. Only downside was the nightclub down below in the glass covered walkway. Even with the doors shut tight the music was very loud and there where alot of drunk teens shouting in the walkway below which echoed loudly . I would maybe ask in future for a room at the front. The street noise would still be quieter. "Good location for sights and shops"
Close to two metro entrances, easy to access from Gare du Nord (one change). Hotel is inexpensive, clean and tidy with recently refurbished rooms by the looks of it. Perfectly adequate as a base - no restaurant for lunch/dinner although a buffet breakfast was on offer but lots of bars and restaurants in the immediate area. Helpful and friendly staff. Clean and simple very good service. Rooms were nice and clean ,good bathroom and shower. Right by tour bus stop and convenient for restaurants and bars in the area. Will go back again .cantbebeaten for the best location and value. "Great location! Would stay again..."
I stayed at this hotel in December of 2015 with some friends. The location is great! It's right across the street from a taxi stop, and right near tons of restaurants, cafes, and shops. It's located in a nook of an adorable little alley, that is not at all shady. The rooms are small, but I've seen smaller. They are updated and basic, but pretty clean. My one complaint is the walls are very thin. If you are looking for a lavish hotel or will be spending a lot of time in your room, this is not for you, but as for me, I would definitely stay here again. "Location is great, rooms are very small"
The hotel is very conveniently located. right next to the metro station. Eiffel tower is about 20 minutes on foot. lots of cafes and restaurants all around. However the entrance of the hotel is from the side lane, not the most impressive. Room size was the biggest surprise. the room almost ends before you get in. guess thats the price to pay for being in the heart of paris. Nice breakfast and reasonably friendly staff. 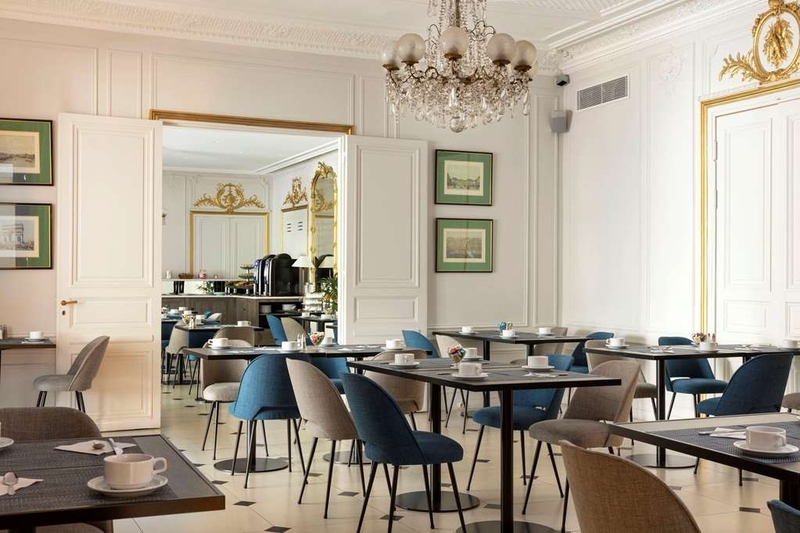 "A perfect stay in the centre of Paris"
Great location within a short walking distance to good department stores such as Galeries Lafayette and Au Printemps. There are many great restaurants and bars around the hotel. Very lively area. We had a corner room which was very spacious with a lot of natural light. Breakfast is delivered within less than 15 minutes, generous portion and good coffee. Complimentary wi-fi with very strong connection. Service at the reception is very efficient and friendly. 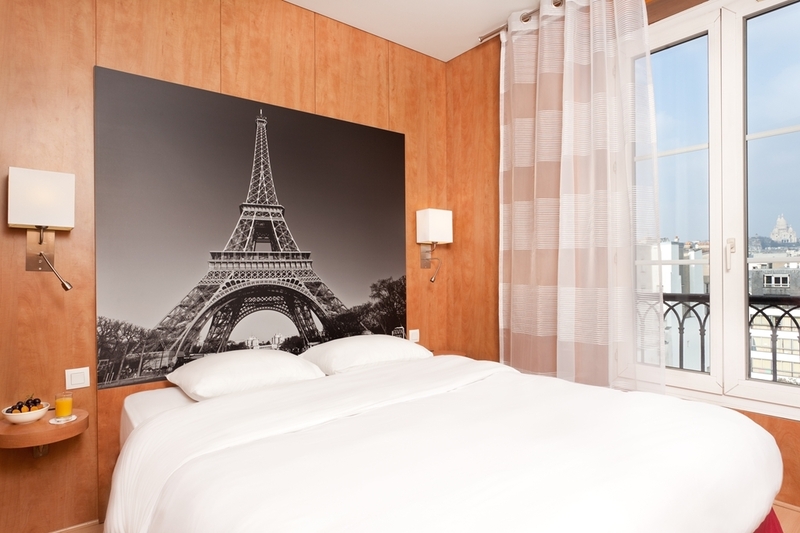 We will definitely go back to this hotel and will recommend to others who want to visit Paris. Stayed here in September. Lovely view of Sacre Coeur from our bedroom window. Room was fine and were given a tray with kettle, tea and coffee when we asked. Plenty of choice for breakfast. Staff were very friendly and helpful. 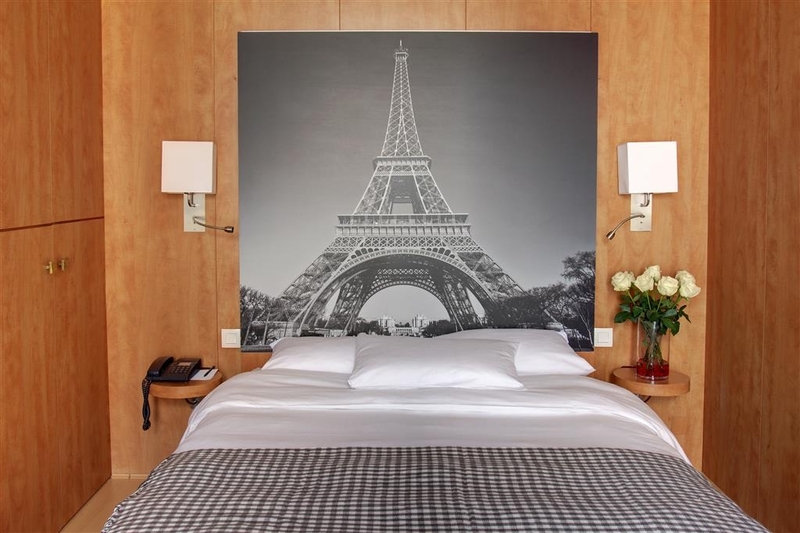 "perfect location to visit Paris and shopping : ))"
I spent 2 times one night this automn and found very convenient location, with renovated room and staff trying to help anytime. I will be back, most probably with family to enjoy Galerue Lafayette, La Bourse and Opera just next. "Have had worse (but not many)"
Good location but a typical example of 'looks good in the brochure' but very different in reality. No room for a kitten let alone swing a cat in the minuscule rooms - if you came find them through the labyrinth of corridors and fire doors. Lift will take you and your bag - about the same as the rooms. Air con, tv, and safe all didn't work in my room and I had a view of a concrete wall. Great city but spend a little extra to stay on a nice hotel and appreciate it. Breakfast not bad though and reception staff tried to speak English though struggled. We stayed one night here while visiting Paris and thought it was lovely. For the price we paid we thought the staff were very friendly and they all spoke English, our room was clean and warm with good facilities including a safe, tea and coffee facilities, a TV and a hair dryer. It is in a busy lively area with lots going on but did not disturb us at night. The hotel is situated between 2 metro stops so you are soon near any landmark or museum you want to visit. On the day we checked out the hotel stored our luggage for us. Great place to stay and very reasonably priced for its location. I wasn't expecting much, but room was entirely the double bed with a balcony door. Shower so small I fell out into the toilet:shower taps hit me in the chest. No fresh toilet rolls or tissues for 4 day stay; we bought our own! Double booked when we arrived, asked to carry our luggage up to 5th floor, no lift available. Very disappointing introduction to Paris. "THEY DO NOT RESPECT YOUR PRIVACY"
I'd like to start off by saying that the front desk staff were very friendly. Hotel is a little out dated, but that is fine. The bad ratings come from that lack of privacy given to us by the cleaning crew. It started the first night when someone randomly walked into our room. It was a loft so they left as soon as they heard us above. No problem yet, since that could be an honest mistake. Since we would rather not have our room cleaned every day, we put out the DO NOT DISTURB sign. It's in both English and French, so everyone can read it. Didn't matter, they came in and cleaned anyway. Hell, one morning at 9AM while we were still in the room and with the DO NOT DISTURB sign out, the cleaning crew came in. We had to ask the lady to leave since she just wouldn't. This went on for the whole 5 days there. On top of all this, when we got home, we noticed some of our stuff was missing. My girlfriend still gets all upset when she thinks about this. She bought her mom a cross from Notre Dame, which went missing. I had a few things go missing as well. The Ronceray Opera was well located and close to public transportation. There was also a wide choice of places to eat and shop. My room and bathroom were large and very comfortable. I had a great view of Sacre Coeur and the windows opened which was nice. Although the hotel was well insulated against outside noise, The was little insulation between the inside rooms. I could quite easily hear my neighbor talking and snoring at night. Despite that, I would happily stay there again and bring earplugs. Good location if a little difficult to see entrance. Booked double for first romantic break with no kids but got a dingy twin. Promised a move but solved problem by pushing beds together and throwing one sheet over both. Breakfast is okay but your table has a tray with your cutlery and cup on to make it easy to clear away. The orange and apple juice ran out and despite numerous guests asking for it to be filled it seems it was too much trouble at 9am with only an hour of breakfast left. If you don't mind poor service and a cant be bothered location is a good location but we won't be coming back. We recently had a 3 night stay in the middle of a roumd the world holiday with our 11yr old. We had asked for a room at the back when booking as the tips on here stated the noise was an issue from the main street it overlooks. This was not a possibility apparently. The first night was on the warm side, and the only way we could achieve a coolish sleep was with the balcony door open as the air conditioner was not working effectively. We mentioned it to the reception desk in the morning, and asked for a different room if unable to be rectified, but the answer apparently was to sleep with the balcony door open. Despite that we had an 11yr old trying to get to sleep... Aside from that, the hotel was very clean, staff were all friendly and the location is brilliant. My wife and I had a wonderful 3 night stay at the Best Western Ronceray Opera. Great location on the Grand Boulevard. Walking distance to the Lourve and Seine. We checked in around 2pm on Saturday and were treated to a complimentary upgrade. The room was more than spacious including a private balcony and big screen tv. Room was very clean. Air conditioning worked well and was needed because we had two very hot days. Bathroom amenities included an overhead/rain fall like shower head. Breakfast was beyond adequate with fresh baked breads, craossaints, pastries, meats and cheeses. We enjoyed filling up every morning and were able to save a few bucks on meals. Would definitely consider staying here again for a return trip to Paris. "Good location, needs a haircut"
The property lies on the Blvd Montmatre, in the thick of things; not normally my favourite location (I prefer the 5th and 6th), but convenient for my business. Although the property sports a fine address, the overall impression is that the hotel is tired and needs refreshing. The rooms (and I had a very spacious "superior" room) was dusty and very old; for aficionados of 1970s paneling it is delightful, but frankly I though it dated. Everything in the room worked, although the electrical outlets were not really well placed for actual use, and the bed comfortable enough. The staff was delightful, and went out of their way to accommodate their guests' needs, interests and questions. I doubt I will be back, but it is an OK property if one simply wants a warm place to bed down. Very clean. The room was small but clean. New bathroom, very luminous. Considering the perfect position to visit Paris (also for work) is not so expensive. I did not enjoy the breakfast but there are star bucks and prêt à manger Just à few meters from it. "Disgusting hotel, not worth the money! " This hotel has only three things going for it; location, free wifi and lovely reception and cleaning staff. The hotel is disgusting to say the least. It's very run down and in desperate need of a good thorough clean. My room was filthy when I arrived. Mouldy bed sheets, mould covered bathroom, toilet semi attached to the wall. The list is honestly endless. I also had a lovely view of a brick wall which was disappointing considering how much I paid to stay here. The breakfast is average and inconsistent at best. One day they were serving off cheese which reeked and squished pastries. The dining rooms are filthy too with stained table cloths and tattered walls. The wifi is excellent and the location is perfect. A quick walk to the Opera and just outside a subway stop. There are plenty of restaurants and grocery stores in the street so you certainly won't go hungry. I definitely won't be staying in this hotel again and was very disappointed with my experience there. "Nothing amazing but nothing bad and good value." The hotel is fairly easy to find; the entrance is inside a gallery, or glass-roofed alleyway/mall, with suitably old-fashioned little shops on the ground level. The staff are reasonably helpful - one went considerably out of her way to show me where to find a bank machine - and there's a shuttle that goes to the airport for €26 you can book through reception. The room was small, but by no means the smallest I've had in Paris, with a closet large enough for my luggage and all my clothes and stuff. The floor was wood, which helps cut down on insect bite problems (I did not have any problems). The bedding wasn't changed during my stay (5 days) but i didn't ask them to and that's fine by me. I did get fresh towels. The wifi is unencrypted and open, but easy enough to use. There was no bathtub in my room but the walk-in shower had a "rain" style head and a regular head on a stainless steel flexible hose so you could use it either way. The window overlooked the roof of the galleria, but higher floors (I was on 2, where ground is 0 and lobby is on 1) can easily see the Sacra Coeur. Breakfast is a buffet; there's scrambled egg, sausage and bacon, a variety of pastries, hard boiled eggs, fruit, yogourt, juices and so on, in what was probably a wealthy person's house in the 18th century. It's a great area, tons of restaurants, bookshops (in this gallery and the one opposite for example), the opera, right next to the Metro, felt fairly safe at night, and was not too noisy. We booked this through our Travel Agent in Melbourne during their annual Expo promotion period, so we were expecting a fair deal and a pleasant experience. Unfortunately it wasn't what we expected. The hotel looks impressive from the website but the room we were first given was a sweat box, small, even by Paris standards, and facing the afternoon sun with ancient air con and a standard fan. Fortunately the hotel had low occupancy and upon request we were upgraded to a spacious "Club" room, with a recently renovated bathroom and balcony at no extra charge. This too had issues with a dripping air con unit and an entry door that required serious force to close. The redeeming features of the property were the very friendly and helpful staff and the excellent breakfast. Location is amongst a plethora of 2 and 3 Star properties, so restaurants and bars abound. It's close to two Metro stations but a little too far from the river for our liking. We would not return nor recommend to friends, so overall 2 Stars. "Very good location for Paris"
Location is very good, having metro station just nearby. A bit old fashion, but very convenient for Paris. View of the rooms are not at all fascinating, but the neighbourhood is nice and full of surprises. i stayed there for a week in Aug. 2012 , the room was small but comfortable. the hotel is directly near by boulevard Montmartre, Musée Grévin, Théâtre des Variétés, Hard Rock Café, its really inside the heart of the city center, every thing is available all the time. Nice location (walking distance to many attractions and just a couple of minutes away from metro). Plenty of restaurants, cafes, shops nearby (as well as the one where you can buy french sim card). Very reasonable cost of the room. Very friendly, efficient & helpful people at reception. Room and furniture is not new and a bit worn out but its well maintained. No disappointments. Definitely will stay there again. Very good value for money. "Comfortable hotel in the heart of Paris"
This hotel looks nice on the internet, but the rooms are very small. Our shower drain got plugged every 2 minutes, the doors are very squeaky and it was noisy at night had to wear ear plugs. The only good thing about our experience here was the friendly staff and the breakfast was delicious and a good variety to choose from. Breakfast was excellent. Location and value were excellent. Staff were all really helpful and recommended a great near-by restaurant. View of Sacre Coeur from bedroom window. Easy access to metro. Would definitely stay here again.